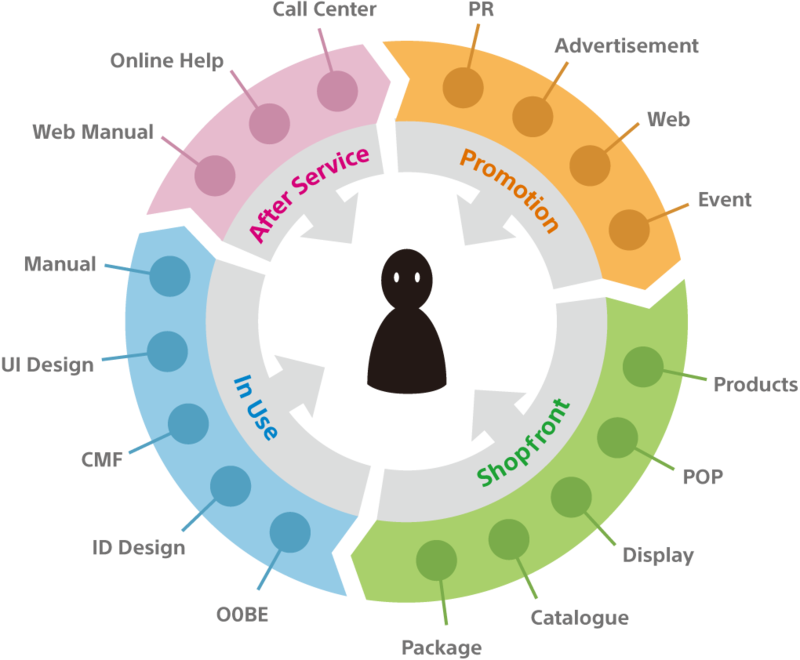 as products keep evolving to fulfill new roles and offer new user experiences. we have developed an original typeface. Join us behind the scenes to see what the project was all about. Printing on products tends to be smaller now, as devices become more compact, and on the screens of smartphones, tablets, and other devices, the display experience is increasingly important. Usability and enjoyable content depends on clear, legible printing and on-screen text. Typefaces are also key elements of design that shape our impression of products and the user experience itself. To enhance product value and user experiences, we thought it was time for a closer look at typeface design. An original typeface would be seen by people in a variety of touchpoints—in products and services, not to mention in ads, in stores, online, and in manuals—which would help us provide a consistent, distinctive, and engaging user experience. Knowing this, we set to work developing a corporate typeface to be used across the company. In development, we sought a firm, sharp typeface that was highly readable. One inspiration was the Helvetica® design, because a typeface without the distinctive formal elements in much Sony packaging and other work to date would diverge too much from the familiar Sony image. We explored how to keep the new typeface as sharp and solid as Helvetica while ensuring it was very legible and reproducible at smaller sizes. 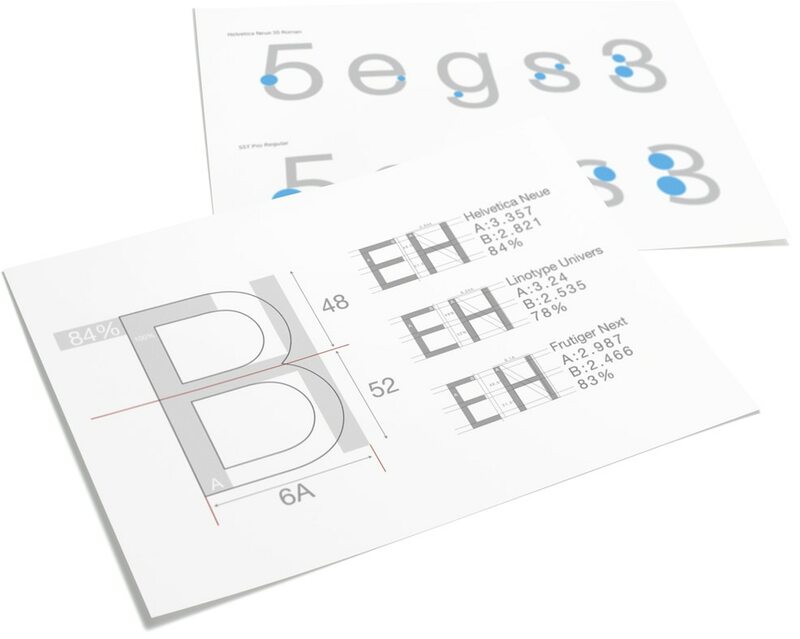 As we examined the forms and structures of many typefaces, another inspiration was the Frutiger® design, a highly readable typeface originally created for airport signage. By deciding what makes Helvetica look solid and Frutiger readable, we defined our basic parameters and designed a typeface to demonstrate our thinking. Designing a timeless, universal, and authentic corporate typeface would require familiarity with the traditions of typography. We also hoped to offer people around the world a similar user experience by adapting the typeface for many languages. These requirements led to joint development with a venerable type company that manages both Helvetica and Frutiger—Monotype. Building on our design concepts, we began working with Monotype Type Director Akira Kobayashi to develop authentic SST® fonts. When people around the world see text in a SST font, it should provide a consistent user experience. That’s why from an early stage, we planned for an unprecedented scale of production, to support not only English and Japanese but also Greek, Thai, Arabic, and many other languages. 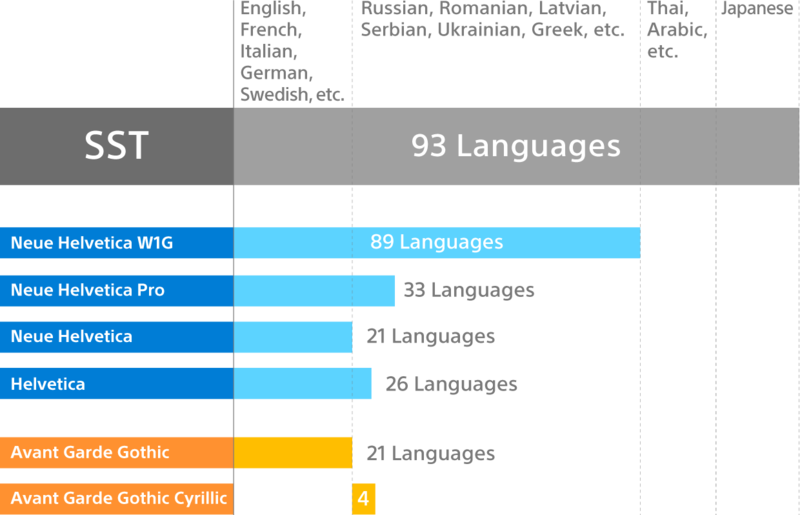 Multilingual optimization drew on the talents of local designers under the direction of Akira. Our typeface ideals were translated, so to speak, into many languages. In the end, the typeface was ready for an impressive 93 languages, enabling consistent communication around the world. Communication depends on the clarity of letters, numbers, and other characters. Toward this end, we sought gentle, organic contours, as well as ample space in what are called apertures and counters in typography—spaces created by curves in letters such as g or s. Characters can be easily recognized even at smaller sizes, which offers excellent legibility from the standpoint of universal design. Individual characters are generously spaced, but for greater uniformity, most characters are a similar width—with a C being only 1.2 times wider than an S, for example. Words look coherent, and space is used efficiently in blocks of text, which enhances readability. Type designers know that optical illusions affect how characters look. That’s why vertical lines are usually wider than horizontal lines. However, line width in SST fonts is designed to look consistent, which makes characters uniform. Characters are also sharp and geometric, with solidlooking vertical and horizontal lines of fairly even width. This fits the familiar image of Sony products well. By fusing these different elements—the sharp forms of Helvetica with the superb readability of Frutiger—and ensuring a good match with Sony product groups, we perfected a new typeface that accentuates the value in Sony products and the ideals behind the user experience. ©2013 Sony Computer Entertainment Inc. All right reserved. Besides enhancing both Sony hardware and the display experience, the new typeface helps provide a consistent user experience at many touchpoints with consumers. It’s already in use on product packaging, in user manuals, and on this website. 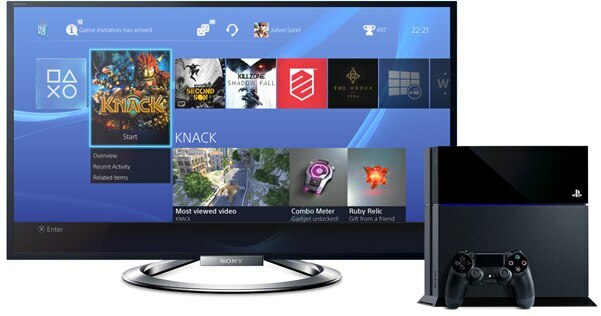 Soon it will be introduced in a variety of products from Xperia™ devices to BRAVIA™ TVs to the PlayStation®4. Developing the typeface took us beyond product appearance and into the user experience itself, and we hope SST fonts make products even more appealing. People around the world may now share the same unmatched and unmistakable Sony user experiences. Exciting products and content is only the start. we take care of all the details, down to the typeface. and may be registered in certain other jurisdictions.